As a city of commerce like Singapore, Tokyo, Hamburg or New York, Jakarta sees plenty of visitors coming to the city for business purposes. With a high standard of meetings and convention facilities, the capital is one of the country's top convention destinations. The others are Bali, Yogyakarta in Central Java, Medan in North Sumatra, Surabaya in East Java, Bandung in West Java and Ujung Pandang in South Sulawesi. These locations offer high-standard facilities and services, professional management, state-of-the-art technology, exquisite scenery and unique cultures. As Indonesia's main gateway, Jakarta's Soekarno-Hatta International Airport serves a growing number of international airlines and provides an abundance of domestic flights. Transport of all forms within the city is readily available. The city is home to a dynamic contrast between Western-style modern urban life-styles and traditional culture. Its rapid growth into a metropolitan city reflects the economic, political, social and industrial development of the nation. 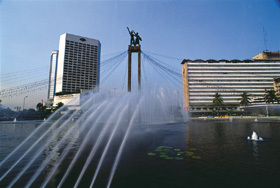 In recent years, Jakarta has expanded its facilities for visitors with multi-star luxury hotels, fine restaurants, exciting nightlife and modern shopping centers, as well as tourist attractions such as Taman Mini Indonesia Indah (Beautiful Indonesia in Miniature Park), restored colonial period buildings, marine resorts in the Pulau Seribu (Thousand Islands) and an extensive beach recreation complex. Despite its status as a city of commerce, Jakarta also offers places of interest to explore. For those of you with an interest in history and culture, you may be interested in visiting Jakarta's museums. The Jakarta History Museum, for instance, provides the background of Jakarta through displays of old maps and antiques including furniture and porcelain used by the Dutch rulers of Batavia, and a 16th century Portuguese cannon which stands just across the cobble stone square. If golf is your passion, you'll be pleased to hear that the city provides a choice of no less than 15 championship of golf courses, several of which were designed by top designers such as Robert Trent Jr., Jack Nicklaus and Arnold Palmer. There are also tens of others in the city's surrounding areas of Bogor, Tangerang and Bekasi. So - Jakarta has an abundance of great things to see - welcome!